Our family recently returned from Israel (June 20- July 1, 2010). It was an amazing time and I would hands down recommend Michelle Baruch - our private tour guide. Our family of four (2 adults and 14 and 11 year old girls) had never been to Israel before. Before the trip, she helped us plan the itinerary, find hotels, and book them. The itinerary was just as we had envisioned. Michelle made the trip of my dreams perfect. Her knowledge is impressive, her personality absolutely delightful and we loved every moment being with her. She is fluent in Hebrew and English. She has taken a specialized course in Christianity and knows the Old City of Jerusalem like the back of her hand. We traveled throughout the country and Michelle made sure we were always well taken care of; with water, snacks, and updated daily itineraries. By the end of our trip, we had a deeper understanding of the country and the people. I cannot wait to visit Israel again. Michelle definitely will be recommended to everyone I know. We hired Michelle to arrange and lead a tour for our entire office staff last Spring. There were approximately 25 members of our staff on the outing- all with different interests and from different walks of life, so the program had to be varied and interesting to all. Michelle invested an enormous amount of time into the planning stage with us in a very non invasive way, to ensure that the best possible result was achieved for all. And , indeed it was. It was an unforgettable day, we toured the Herodian site in Gush Eztion, went to a winery and a cheese making farm, and then had a wonderful lunch in a glorious setting. Every member of staff commented on how much they enjoyed the day. As for Michelle herself, she conducted a professional balance between giving us important information and not overwhelming us. She was bright, personable, bubbly and very pleasant to be with. I would highly recommend her touring services, and we would most certainly take her again. Michelle is a fun tour guide to travel with. She is knowledgeable, energetic, and loves the land of Israel. As an Israeli myself, who hiked and toured the land, I have been impressed by how much more Michelle could contribute to my experience of Israel and its scenic places. Do yourself a favor, and visit Israel with Michelle of Apricot Tours. My first trip to Israel was wonderful. The dry desert air was much cooler than normal for a July in Israel. We were standing at the Beit Knesset (synagogue) at Masada. Our fantastic tour guide, Michelle, told us that a parchment that had the Ashrei (Psalm 145) was found right near here. She handed my thirteen-year old son a siddur, and we are now listening to him chant it. A group of tourists from the Carolinas applaud him at the end. Moments later, I found myself dancing a hora with my family along with some teenage girls that had spontaneously joined in. They told us that this just does not happen to you back in the States. This was very emotional for me, and it was not an isolated case. We had arranged from California to have Michelle make all the preparations for my son to have a Bar Mitzvah at the Western Wall. 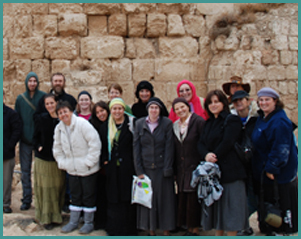 When we arrived with Michelle on that Thursday morning, we found the Kotel a very busy place. However, everything was ready for us and our son became Bar Mitzvah there, specifically up front, right at the wall and closest to the mechitza. Afterwards, my wife told me that it was, so nice to be right there, standing on a chair inches away, taking everything in. I came to realize that there is no better spot at the Kotel. And did I mention the great restaurant where we had a festive lunch afterwards with great food for twenty people at very reasonable prices? After lunch, there were lovely comments with the presentation of a Bar Mitzvah certificate, and more hora dancing while the Bar Mitzvah was lifted up in his chair. Michelle helped us make the Bar Mitzvah very special. For a day trip on our own from Jerusalem, we had various suggestions from Michelle including a stop at Beit She’an. This again was a perfect recommendation based on our interests and time constraints. My wife had visited her great grandfather in the late 1960, and now my youngest son could visit the graves of his great-great grandparents with a gentile warm breeze on a hill on the east bank of the Jordan River. The experience at Kibbutz Afikim was enhanced by the two stops on the way from Jerusalem, and the recommendations of where to go in the Golan and around Galilee. The Rosh Hanikra Grottos at the Lebanese border are beautiful, and I am glad we also went there. We visited Nahariya, Acre, Haifa, Zichron Ya’akov, Netanya, Herzliya, Tel Aviv, and Jaffa along the coast. We went to Netanya and the Wingate Sport Center multiple times, as our eldest son was a member of the American Maccabiah delegation competing in men’s open swimming. Michelle’s tip on where to park at the Maccabiah opening ceremonies added to that incredible experience too. The recommendation of when and where to go so we could see all of the Maccabiah events we wanted and still visit many other sites in Israel was outstanding. The Aaronson museum in Zichron Ya’akov, the Diaspora museum in Tel Aviv, and Yad Vashem Holocaust Museum in Jerusalem were the ideal top recommendations for us – a perfect fit. Shopping on Ben-Yehuda Street, all the sites, tips on driving, the historical information, the amazing amount of sightseeing that we did in 17 days was only possible with the knowledge provided by Michelle. She made some terrific suggestions of hotels for us based on our budget. Wherever we went, Michelle had such amazing anecdotes to share about the sites we visited which enhanced every sightseeing tour. I am still basking in the warm memories of the best vacation of my life. I’m sure she did not arrange the weather the last two days in Jerusalem, it rivaled the weather of the most perfect days we have here in California. I do know she added the something extra to every day of our vacation that made it phenomenal. Thank you Michelle!! !